This charming California bungalow home has hand painted murals and exquisite needlecraft done by the artistic owner. Lovely antique furniture and ragging on the walls create a feeling that is both old world and very Californian. A sunroom adjoins the kitchen and garden, and the interior is rag painted in an soft apricot color on textured plaster. 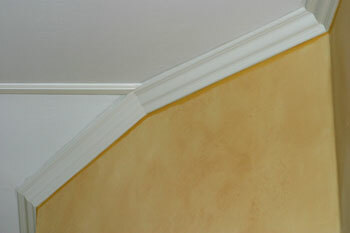 The owner came to Moulding Masters hoping to use crown moulding in her living room. She was concerned about the challenging angles in her walls and ceiling, but Juan and Ivan did a superb job of fitting the crown into the tight angles. Charleston Crown MM 118 was used on this job. Click here to see Charleston Crown in our Catalog. The owner had an additional problem of cracks in the ceiling along the seam of the pitched gable. Mark solved this problem using a chair rail along the seam, concealing the cracks. 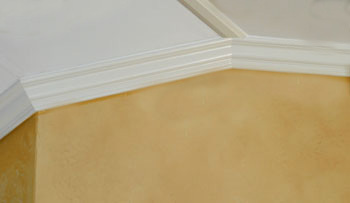 Watch the videos to see how Moulding Masters solved these challenges.